Once upon a time there was a competition called the Rheineck Rock Award. Rheineck was a fairly mediocre beer, but the Rheineck Rock Award was a decent slab of money - enough to make a full-length album, as long as you didn't demand state-of-the-art equipment and a famous producer. In its first year, it was won by Ardijah, who made a safe and saleable album of safe and saleable soul/funk/pop songs, a couple of which were actually rather decent. Their second album, released a couple of years later, turned out to be mostly songs from the first album, with a few changes and additions. This was also safe and saleable although having fewer rather decent songs on it. Since then the group have popped up on the periphery of the music scene every now and then, still working hard, still being as safe as they always were. 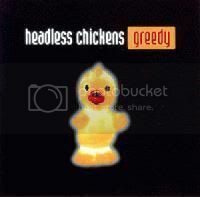 In its second year, it was won by the Headless Chickens, and all hell broke loose. The Chooks were anything but safe. At the time, they'd already released a mini-album of very strange music, having risen from the ashes of the even more dark and manic Children's Hour a couple of years previously. Radio announcers and safe-and-saleable-music-factory-managers around the country went ever so slightly ballistic (to the extent that there are stories that one radio announcer was actually given a Talking To by a Legal Person). Their bottom line was: what is this crap? It will never sell! Almost a quarter of a century after the fact, Ardijah are fairly much a footnote in New Zealand's music history, while the Headless Chickens have had a number one single in New Zealand and a chart hit in Australia. Songs like Juice, George, Cruise Control and Mr. Moon are still well remembered. And as for the Rheineck Rock Award? It staggered on for another year, in a different format (more winners, less money); the one of the third year's winners that I actually remember being Breathing Cage. Musicians: Chris Matthews - vocals, guitars, samples, loops, keyboards; Bevan Larsen - bass guitar. Guest musicians: Bevan Sweeney - drums; Grant Fell - bass; Angus McNaughton - samples and loops; Fiona McDonald - vocals, backing vocals; Flex - samples; Rachel Wallis - backing vocals. Songs: Dark Angel; Stalk of a Cherry; Secondtime Virgin; Cipher; Magnet; Fire; Electricity; Chicken Little; Smoking Big Ted; Black Water Rising; Escalator; Day of the Locust; George. Yep. It figures. They are still my all time favourite NZ band. It's just a shame more of their material isn't available... sure, Chickens Hits is a good overview of the band (and the bonus CD of remixes is enough to make the compilation a must-get even for those of us with their regular CDs anyway), but they're more an "albums" band than a "hits" band. I'd hazard a guess that "something" would be Fiona McDonald... all three of the Chooks' albums would be worthy of inclusion on this list, really, but I've only got 31 slots to fill. (That said, either Stunt Clown or Body Blow could well appear later on... my not being sure about this has nothing to do with being coy about my plans for later this month and everything to do with the fact that I don't actually have any plans at all... I'm never quite sure on what I'm going to feature until I'm just about to do it).